The door is in place? Now keep it there! In any room, farmhouse style doors display your personal style and add warmth and character. Now add our new & improved ORACLE Glide at the base of your door, to quietly and smoothly open that portal to reveal a glorious view or an inner sanctuary. The last thing anyone wants is a noisy door waking up the children or alerting someone to your late night snacking. Serenity is priceless, & our innovative ball bearings reduce noise and ensure that the craftsmanship & artistry of your door can shine, & be the only thing to leave an impression on your friends & family. Never worry again if your door has the correct groove, or if you will be stuck with a frustrating installation. Our guide has the widest channel available! Just mount it, adapt the roller size, and tighten. Done! With over 10 years of experience in the industry, our guide withstands wear and corrosion. The bracket and wheels are made from the finest & best components available. ► Longer life thanks to our exclusive ball bearing rollers. ► Precise 90 degree angle ensures effortless movement & no sticking. ► Lock washers keep the rollers firmly tightened, no matter how many times they guide your moving masterpiece. ► Comfortably fits almost any door. ► Prevent your door from swaying. ► Protect floors and family. So that's exactly what you get. Add our 30 day free returns, & you're all set. Go ahead, Buy NOW & glide into your future! BARN DOORS ARE OUR THING | The ORACLE Glide is unique & stunningly crafted to give you everything you need to support any door. A strong guide is so important for barn doors, and our NEW DESIGN suits most hardware styles. Of course being good-looking isn't everything; doors should stay NOT sway. That's why quality is our #1 priority. UNIVERSAL SOLUTION FOR SPACE SAVING | Just what every fixer-upper wants! Designed with class-leading functionality for single or double sliding doors, our roller guide adapts to you, fitting any door up to 2 & 3/4 inches thick when using both rollers. Need more space? Remove the inner roller and breathe easy with over 3" of unbeatable support. MINIMAL INDUSTRIAL DESIGN | Sometimes less is more. In order to accent but not overpower your cozy home, our adaptable and muted, LAY-FLAT design is perfect. Completely flush with the floor and only 1/4" thick, it's stylish and slimmer than the competition. If what you want is a sturdy and heavy duty solution, your door will be in good hands. WE"RE ALL ABOUT THAT BASE | Innovations including a Smaller Footprint, Safer Rounded Corners, Lock Nuts, Tailored Design, and THE ORIGINAL double bearings rollers in the industry ensure that you get THE BEST guide with no confusing setups. Besides all that, our Solid Steel Base and Superior Black Powder Coating ensures increased resistance to corrosion and chipping, with no maintenance required. HASSLE-FREE INSTALLATION | Ours is a complete package, and SO EASY to install and assemble as our clients attest to. With included screws, installation guide, and the wrenches needed to tighten all the hardware, this is the only all-in-1 sliding guide that you'll ever need. 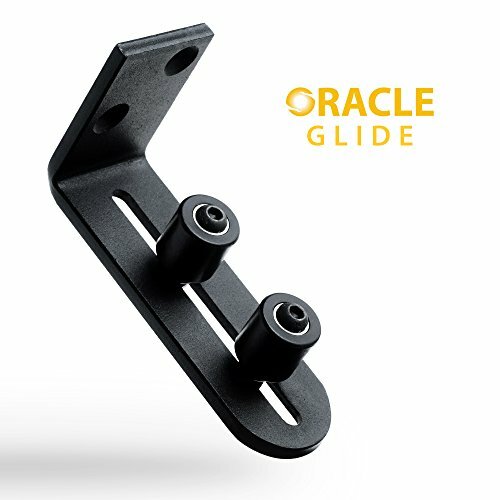 We are honored to offer you our ORACLE GLIDE, the best guide available. HAVE A QUESTION? Please scroll down and ask us! If you have any questions about this product by -ORACLE-, contact us by completing and submitting the form below. If you are looking for a specif part number, please include it with your message.